1. Sear all sides of chicken pieces in butter and 1 tablespoon of olive oil on medium heat. 2. Turn heat to medium low and continue to cook chicken until no longer pink. 3. In separate pan, saute onion, garlic, green pepper, and jalapeno pepper in 1 tablespoon olive oil on medium heat until soft and translucent. 4. Add vegetable mixture, coconut milk, and spices to chicken. 5. Cook until heated through. 6. Serve over cooked rice with fresh basil as garnish. I love exotic flavors. 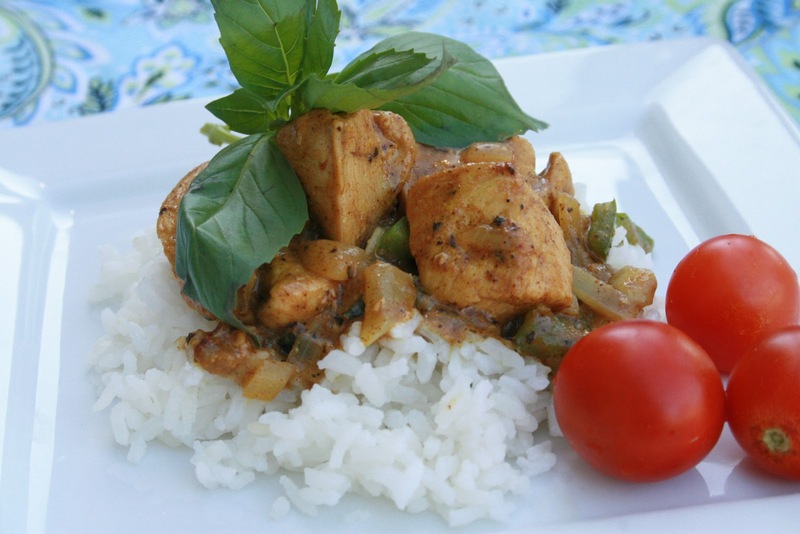 This chicken dish surprises the palate with the varied use of spices we don't use readily in savory recipes in the United States. The coconut milk gives it a slightly sweet taste while the jalapeno pepper gives it a kick.